A faculty meeting took place on Wednesday, March 20 that caused faculty members to fret over the reallocation of resources as well as job security. Many members of the faculty felt as though they were being excluded from the academic prioritization process. Following the meeting on March 27, where Johnson clarified his intentions and communicated his goals, the faculty seems to have more confidence in him. “My view of the meeting that we just had was fairly positive. It seemed like the president was receptive to our concerns and answered our questions honestly and openly,” said Fitzpatrick. “One thing I was really impressed with is the faculty had concerns and raised them, and President Johnson responded right away both in an email and by coming to the additional faculty meeting last week, where I thought he was very frank and forthcoming about what was and what was not settled about the process. And I think that was very helpful to people,” said Farrar. “[Johnson’s] message was that all constituents on campus will have a seat at the table as we look towards the strategic planning process. And he specifically said faculty has a seat at the table as we look toward John Carroll’s future,” said Mike Scanlan, executive director of strategic communications for the University. However, there are still lingering questions by the faculty and various concerns about the Academic Strategy Partners, the company that Johnson has contacted to facilitate the academic prioritization process. “To some extent, it depends on what the institution —whether that is the president, the board or whoever —wants the end state to be. What do we hope to get out of prioritization? Is this process with this firm going to accomplish this for us? I think all of those are open questions right now,” she continued. Going forward, Johnson has scheduled a community forum to explain his vision for JCU’s future. “On April 10, he is going to bring a vision to our community, and that vision is the baseline for constructive conversations for the future. That vision is larger than simply academics,” said Scanlan. To manage the massive changes, Bishop wants to create a special projects committee that includes senators and students who would like to join. The committee would be charged with the drafting of special project proposals and the pursuance of them until completion. The special projects committee is there to serve all students who have an interesting idea or want to see something new on campus. “That is the goal of the special projects committee,” said Bishop. The audience, as it was primarily composed of members of our student government, reacted strongly to Bishop’s plans. Maddie Tobolewski, executive vice president elect, was a special piece in Bishop’s blueprint for a new Student Union. Previously, the EVP had no specified role. “I think the Executive Vice President has a really great opportunity to insert themselves wherever they’re needed,” said Tobolewski. Though the EVP has been able to serve where they wished, Bishop is integrating the position to serve as a link between the Executive Board and Senate, which will operate separately next year. Tobolewski appeared open to this idea. In her statement, she said, “we only work if we’re working together.” By being the lane of communication between the Executive board and the Senate, she would be able to accomplish this. Another responsibility she would have would be to “make sure that everybody knows where to find and has read the constitution of the Student Union,” said Tobolewski. This was met with snaps and applause, indicating that some members of the student government have not read nor are familiar with their own constitution. After the debate and ensuing election, JCU’s student government formulated as expected. Lauren Phillip was elected as the Vice President of Communications, Leah VanDine was elected as the Vice President for Diversity, Equity and Inclusion, Eddie Jenkins was elected as the Vice President for Programming, Kyle Blasinsky was elected as Vice President of Student Organizations, Brianna Sweeney was elected as Judicial Affairs, Sara Girard was elected as Vice President for Business Affairs, Maddie Tobolewski was elected as Executive Vice president and Mike Bishop was elected as the president of the Student Union. 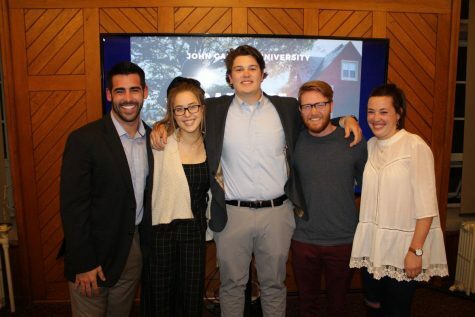 In the 2018-2019 school year, the elected board will change the way students experience John Carroll. This will be pioneered and observed by the 24 students that fully attended the debate.